A remarkable city mixing the best elements of past and present. The excitement of a huge shopping complex to the pure relaxation of open fields and historic buildings. Ferry Meadows Country Park is a great place to moor up for a day offering entertainment for all the family. With over 250 Acres a huge watersports centre, lakes for boating and sailing, go back in time to Nene Valley Railway. Approaching Peterborough city from the east side along the embankment, an evenings entertainment can be enjoyed at the Theatre with nightly shows available. 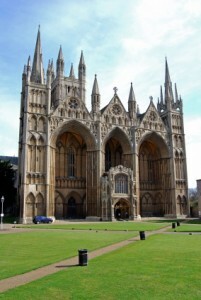 Peterborough was a Roman stronghold and the base for one of Roman Britain’s largest pottery industries some 2,000 years ago. First World War nurse, Edith Cavell, was educated in Peterborough at Laurel Court the Norfolk-born girl was educated before taking her first overseas post as a governess in Belgium. One of the city’s hospitals in now named after her. Step back further in time to 1070 and stories of Hereward the Wake emerge. He arrived in the city with his soldiers and took control of the abbey. Nene Washes RSPB site provides an excellent point for watching wildfowl and waders. In the Fens you will find the perfect conditions for cycling, minor roads, cycle tracks, disused railways and plenty of river bank paths. The flat terrain makes the going easy for experienced and beginners alike. Market day is everyday in Peterborough. There is a huge undercover display of stalls through the other side of the shopping centre. Just what you’d expect from a major city, the choice is yours. If you are enjoying your new way of eating on board, then why not stay afloat and let someone else do the cooking ? Peterborough Embankment has a choice of two boats to eat out on with excellent menus along with bar as well if you just fancy a drink. Queensgate Shopping centre, is right on your doorstep with indoor and outdoor shops. Simply moor up and you are right outside one of the largest supermarkets in Peterborough to buy your holiday provisions and 2 minutes walk from the heart of the precinct for those shopaholics.